UPDATED: Sun., March 18, 2018, 9:32 p.m.
GOODING, Idaho – Maizy Wilcox is usually too focused on the game to acknowledge the scoreboard. So was the case on Dec. 11, when the Idaho School for the Deaf and the Blind girls basketball team played at Carey. Wilcox, a freshman point guard, knew the game was close, but she didn’t realize where her team stood until after the final buzzer. She looked at the scoreboard and saw a one-point win in favor of the Raptors. Ten years ago, as ISDB felt the weight of the Great Recession, the success of the girls basketball team was low on the school’s priorities. Around that same time, ISDB was in jeopardy of closing, largely because of the state’s six regional outreach programs – regional schools for the deaf and the blind that, in some cases, had more students than ISDB. ISDB’s enrollment was 97 as of early February, and nearly half of the student body has rejected outreach programs to make the long journey to Gooding every week. When the girls basketball team celebrated its win in Carey on Dec. 11, it was a payoff for the role sports played in the school’s resurgence. Darcy said it’s been about three years since an ISDB student played football or soccer, though some students occasionally express interest in the sports. ISDB provides sign language interpreters for any student who ventures over to Gooding High. When opposing teams travel to Gooding to take on ISDB, they prepare for an atmosphere unlike anything they’re used to. ISDB has a gym of comparable size to most 1A Division II schools. Cheerleaders and a smattering of fans attend each volleyball and basketball game at ISDB, just like they do at other small schools. They cheer and argue like any other fans, but many of the spectators are visually impaired or hard of hearing. By nature of their impairments, they’re quieter than other fans. The action on the court is perhaps the most striking. Most ISDB players are deaf but not blind, so they often glance at their coaches to receive instructions in sign language. A coach like Anderson, who is deaf, wouldn’t yell at his players or the referee even if he was steaming in anger. “My players stop talking,” Wade said. Some visually impaired ISDB students have played sports, but the vast majority are students who are deaf/hard of hearing. Several hard-of-hearing students, such as Maizy Wilcox, can have normal conversations with people who have perfect hearing. Sign language is more of an aid than a necessity. Harris, now a junior, was the only player on the 2017-18 boys basketball roster who had previous experience with the sport. That’s been the norm for decades at ISDB. The inexperience, along with small rosters, contributed to its drop to the junior varsity level. Those factors also make scheduling difficult. Some teams in ISDB’s conference like to schedule tough opponents, Allison said, so ISDB’s roster size and inexperience can make it difficult to find takers. About half of ISDB’s students live outside of the Magic Valley. Most out-of-region students live in cottages on campus from Monday until Thursday. All 11 of the Raptors’ boys basketball games (10 for the girls) this season were played on Monday, Tuesday or Wednesday. Wilcox’s hometown of Kamiah is more than 300 miles away from Gooding, which makes for a long, exhausting schedule each week. She wakes up around 2:30 a.m. every Monday, takes an hour-plus car ride from Kamiah to Lewiston, takes a flight to Boise and a bus ride from the airport to ISDB that lasts about 90 minutes. Wilcox tries to sleep on the plane and the road before she arrives at ISDB around 9 a.m., but it’s not easy, especially on the plane. She usually takes naps after school is over, but when she’s playing sports, she often has practice right after school on Mondays. By practice time, her energy is in short supply. “You’re around people like you,” she said. Darcy posed a question for people who wonder what it’s like to be deaf. “How badly do you miss flying?” he asked rhetorically. He didn’t mean flying in a plane, but literally flying, as if you’re a bird. You don’t miss flying, of course, because you’ve never experienced it. This, he said, is how deaf people think of hearing. “They see themselves as deaf, and that’s it. It’s a culture. It’s not a disability,” Darcy said. “Deaf culture has its own jokes, and one of the running jokes is: Why do farts smell? So deaf people can enjoy them, too. ISDB students like Harris and Wilcox grew up around people who weren’t like them. They were often the only children in their classes, schools and communities who were hard of hearing or visually impaired. They’re not always treated poorly, but they simply can’t communicate with people who have clear vision and the ability to hear. Gray, who just finished her first year as ISDB’s head girls basketball coach, said she and her players formed a bond, in part because she’s not much older than the players. It took her a little while to grasp sign language, but she embraced the challenge. Gray had to grow accustomed to her players’ hectic schedules and their Monday sluggishness (none of her players live in Gooding), and she had to adapt to their relative inexperience with the sport. She taught them the basics of basketball, such as ball handling, when practice began in November. The inexperience also eased the pressure. The girls basketball team hadn’t won a game in 10 years, and it was playing at the junior varsity level. Gray could focus more on education and fun than winning. Harris is happy he picked up basketball at ISDB, but he’s content to let it go when he graduates. He plans to go on a mission for the Church of Jesus Christ of Latter-day Saints before becoming a landscaper or an electrician. 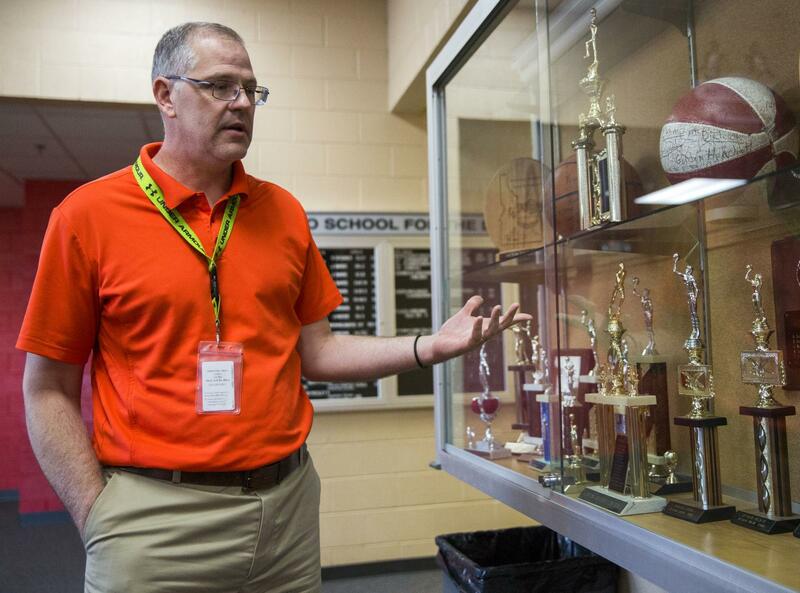 Sports are a small part of the school, which looked in danger of shutting down a decade ago. Deaf and blind children still would have gone to schools catered to them, and they wouldn’t have been forced to wake up at 2:30 in the morning to attend them. But Wilcox, Harris and many of their schoolmates are happy to get up early and travel long distances to attend ISDB. They’ve found a community of people who are like them. They don’t know how a regional outreach program would compare to ISDB. They can’t imagine playing for a varsity basketball team full of players with perfect hearing. Published: March 17, 2018, 3:10 p.m. Updated: March 18, 2018, 9:32 p.m.